I wasn’t aware that Lee was a “basketball standout” in HS. I saw him on the Rivals database of past recruitment classes for PSU - under baskeball. I thought it was a glitch until I googled “Sean Lee basketball”. 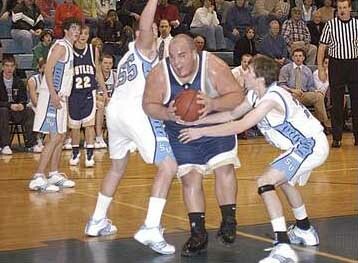 Anyone remember if he had any intention of playing basketball? How good was he? Yeah. Its a slow off season. [quote=“noobd, post:1, topic:1305”]I wasn’t aware that Lee was a “basketball standout” in HS. I saw him on the Rivals database of past recruitment classes for PSU - under baskeball. I thought it was a glitch until I googled “Sean Lee basketball”. [quote="noobd, post:1, topic:1305"]I wasn't aware that Lee was a "basketball standout" in HS. I saw him on the Rivals database of past recruitment classes for PSU - under baskeball. I thought it was a glitch until I googled "Sean Lee basketball". I don’t know anything about Sean Lee’s hoops career, but I was about to make the same comment. I don’t think the linebacker position translates well to basketball due to the wieght that those kids need to maintain in order to play LB. D-Linemen can play in the frontcourt, but LBs are not usually not tall enough. A guard with a playing weight of 220 is not optimal. The “Football Demon” has recently struck some of the top WPIAL hoopers. Terrell Pryor, Jon Baldwin and Todd Thomas were all excellent hoop prospects at a young age. Heck, when I introduced Pryor to this board I felt sure he would be an NBA Star. BUT by the time each of these kids played their senior HS year they were NO WAY NEAR the hoop player projected of them. But at least 2 of them (maybe 3) should get big NFL money. One more PSU note. A Q Shipley scored about 15 ppg in his junior year on a good Moon HS team. After gaining about 40-50 pounds he was a “limited minutes” player in his senior year. [quote=“tundra, post:4, topic:1305”]The “Football Demon” has recently struck some of the top WPIAL hoopers. Terrell Pryor, Jon Baldwin and Todd Thomas were all excellent hoop prospects at a young age. Heck, when I introduced Pryor to this board I felt sure he would be an NBA Star. BUT by the time each of these kids played their senior HS year they were NO WAY NEAR the hoop player projected of them. But at least 2 of them (maybe 3) should get big NFL money. Tyrell Sales and Josh Gaines were both 1,000 point scorers in high school. Brandon Short captained a State Champ hoop team at McKeesport. He was an inside post player/rebounder. McKeesport also won a state championship in football. But, I think, the championships were in different school years. [quote="tundra, post:4, topic:1305"]The "Football Demon" has recently struck some of the top WPIAL hoopers. Terrell Pryor, Jon Baldwin and Todd Thomas were all excellent hoop prospects at a young age. Heck, [b]when I introduced [/b] Pryor to this board I felt sure he would be an NBA Star. BUT by the time each of these kids played their senior HS year they were NO WAY NEAR the hoop player projected of them. But at least 2 of them (maybe 3) should get big NFL money. Tyrell Sales played for Butler HS. He had a teammate named Nate “Big Rig” Hartung. By far, my favorite high school player. He played in the BIG 33 game. A MASSIVE individual, he was the strongest high school kid in the country (won many powerlifting championships). He was generously listed at 399 pounds. Wow…, does he have any eligibility left?? He could be the “insider player” Kid has been looking for. Hartung went on a Mormon mission out of high school (440 lbs), ended up at BYU in 2008 (got down to 335) but didn’t pan out there. Looks like he’s a senior center for Eastern Arizona Junior College this year.